The warmest season of the year has been reached, now people would be all crazy about keeping their bodies cold otherwise the hot blazing sun can cause high fever and serious illness! To keep yourself safe from fatal extra hot sun rays, you should increase the water fun at your outdoors like swimming pool diving, outdoor showers and garden baths and consuming cold beverage should also be in your priority list to withstand the hot summer days! 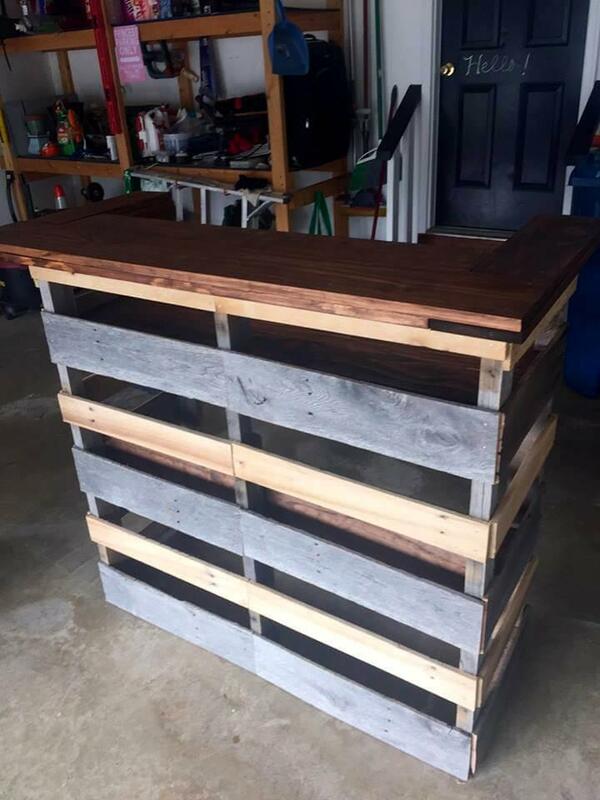 It is also a season of beverage parties and to let your organize a better party environment, DIY is having here to offer this DIY pallet bar to you which would all be the item of major importance if you need to install a bar anywhere at your outdoor or indoor! 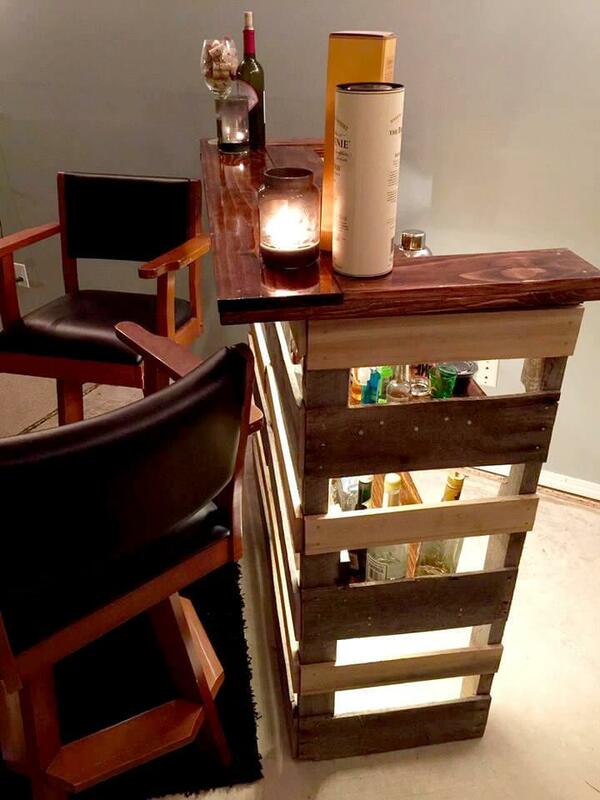 You can follow the steps given in this pallet bar if you also need a perfect wooden bar for you shop or party place! 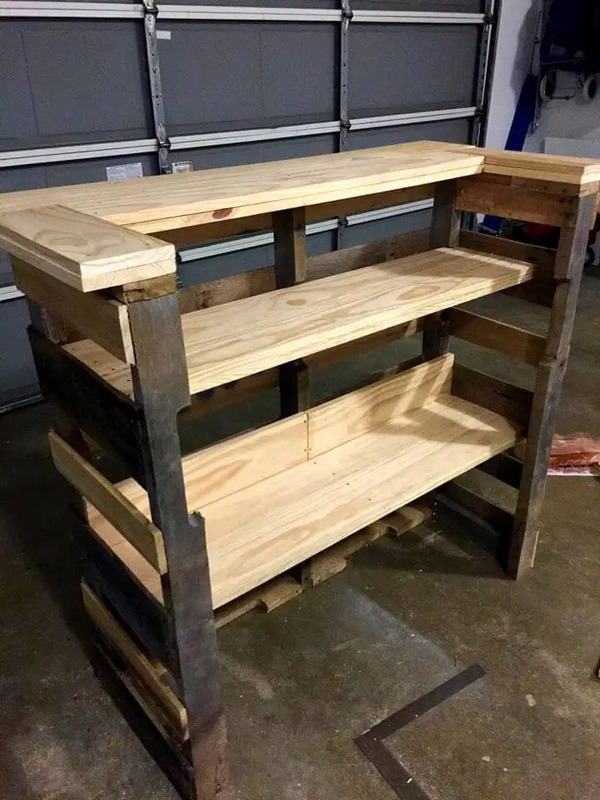 This bar design is having two built in shelves for storage of beverage bottles and a counter top to serve the drinks and you will definitely have a free hand in your case to gain any number of build in shelves and any size of this bar design! 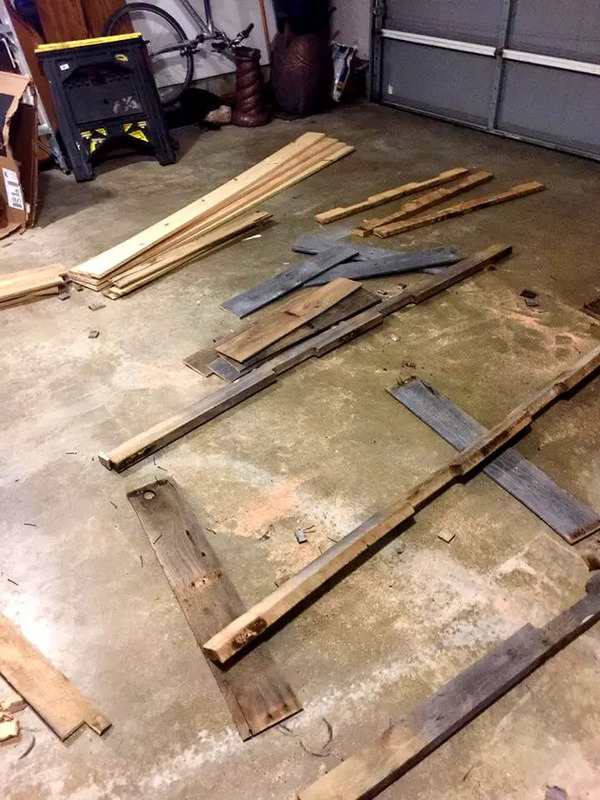 Entire design is to integrate with single straight wooden lengths as you can see so very first step would be the cleaning and dismantling of pallets, help yourself in dismantling of pallets using well suiting tools! 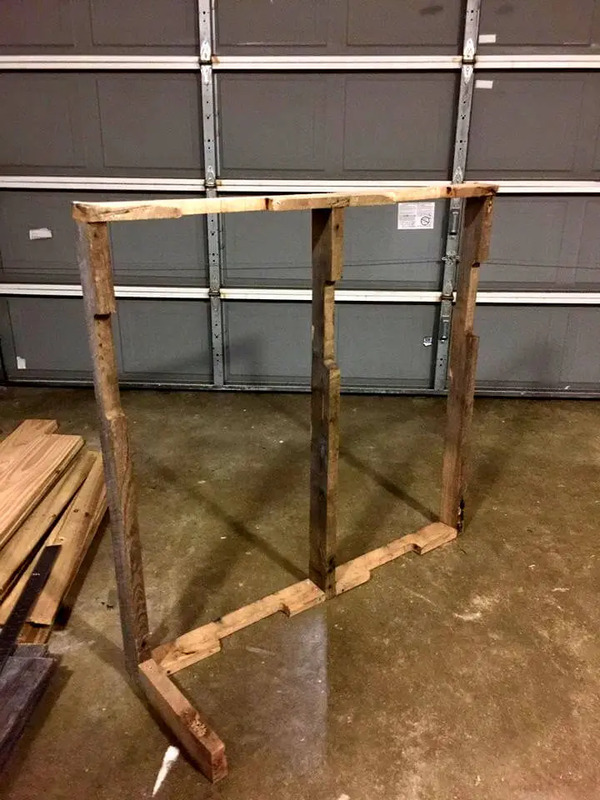 Grab the stringer boards which are always stronger than straight pallet lengths, and make the front square frame of the bar table out of them, do add nails or screws to point of junctions to secure the entire frame! 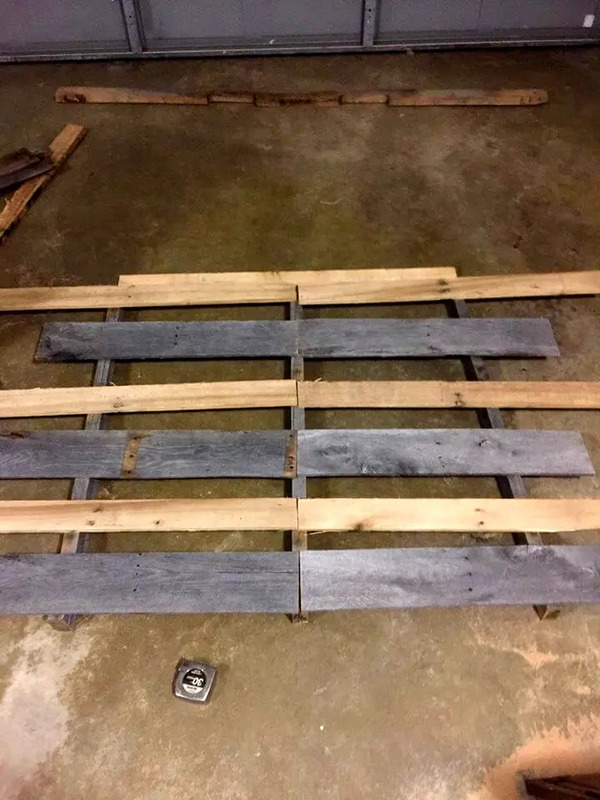 Now fill up this handmade frame by going with flat but slatted arrangement of other separated apart pallet straight lengths, here pallet plans having a rustic grey and natural wood tone, have been used! Now built the sides of the bar and just built the additional hollow square like frames using more stringer boards! Now fill up the side frames too for a robust base frame of the bar! 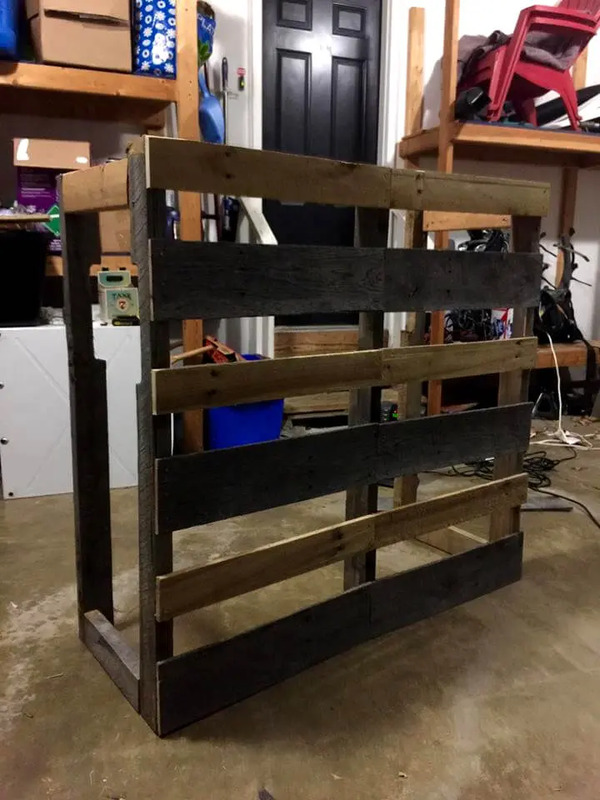 Take a roundup of all installed sides of the frame and make sure you have secured all the corners of this pallet bar finely! Make tight again the loosely bound pallet slats if you find any! 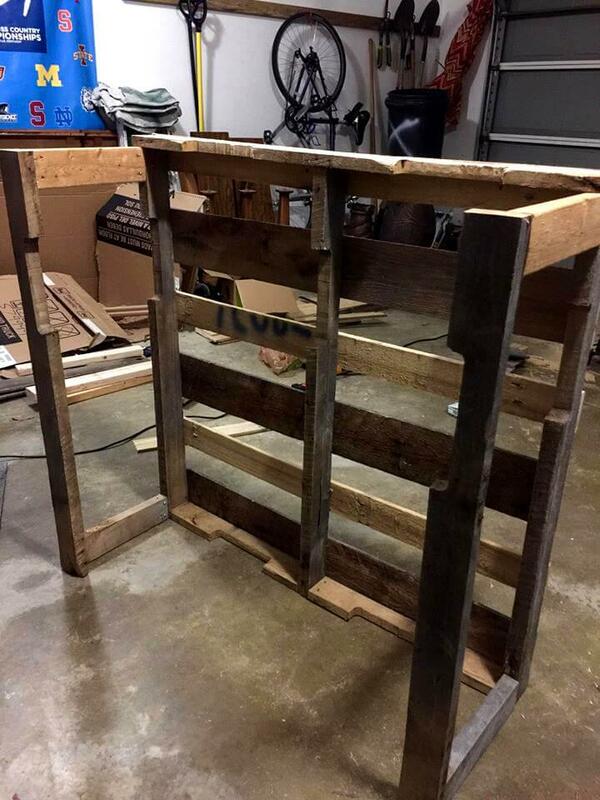 Now you have to install the counter top of the bar which should be sturdy and edged and this has to be done here with precisely cut and well sanded robust pallet slats! 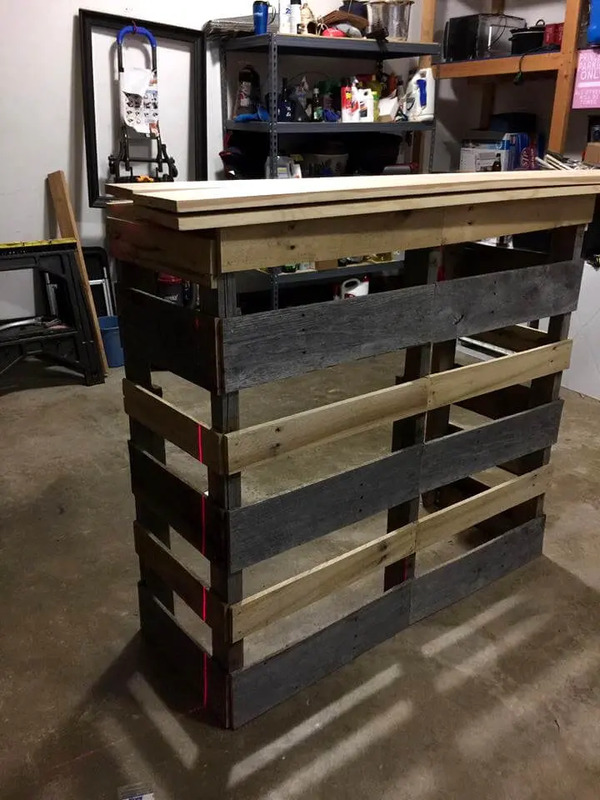 Use the double layer of pallet slats to install the counter top and also lower shelves and do use the well gritted and glowing wooden lengths for installation of bar surfaces an they should be splinter free also! 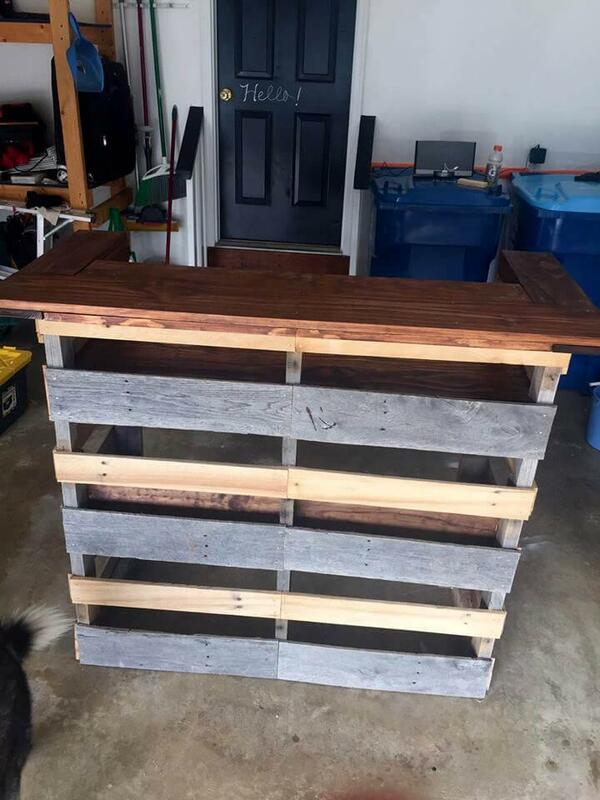 Design is all complete here and you need now to plan a nice finish and you can add the custom paint colors, stain coats and also final sealant coats in your plan for a custom appearance of this self-made bar! Sand the surfaces again for zero popped up splinters and do rub the surfaces for ever smooth hand gliding! 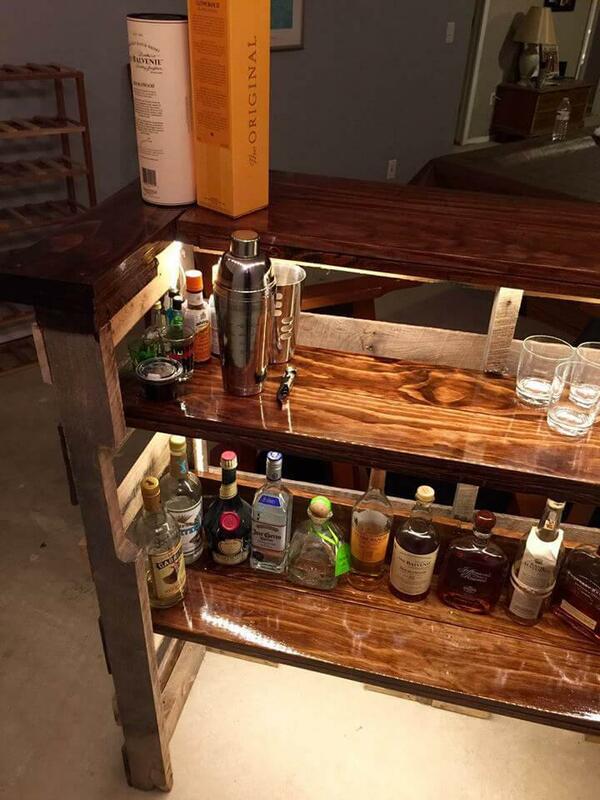 Now apply the stain coats and final wooden sealant coats for weather and water proofing of the bar surfaces! 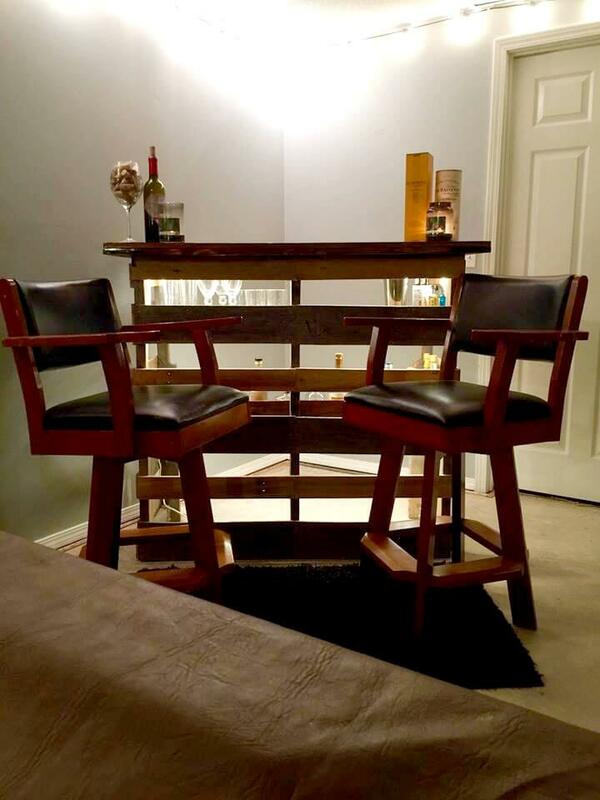 The final finishing coats give the alluring dark brown shade to all bar surfaces which also shine beautifully and this brings the modern furniture elegance to entire bar design! 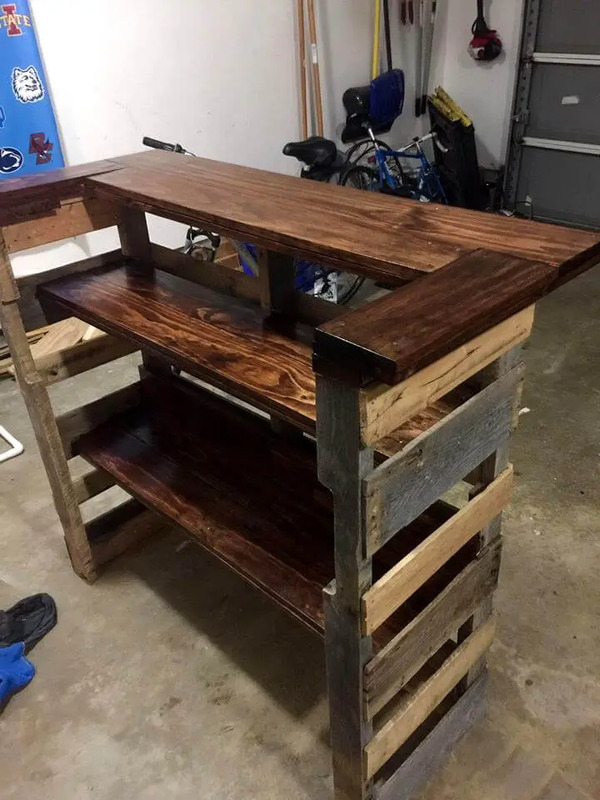 Here it has been decided to create a rustic yet modern look of the bar design so only the counter top and shelves have been stained and varnished and rest of entire design comes in natural rustic tone of wood! 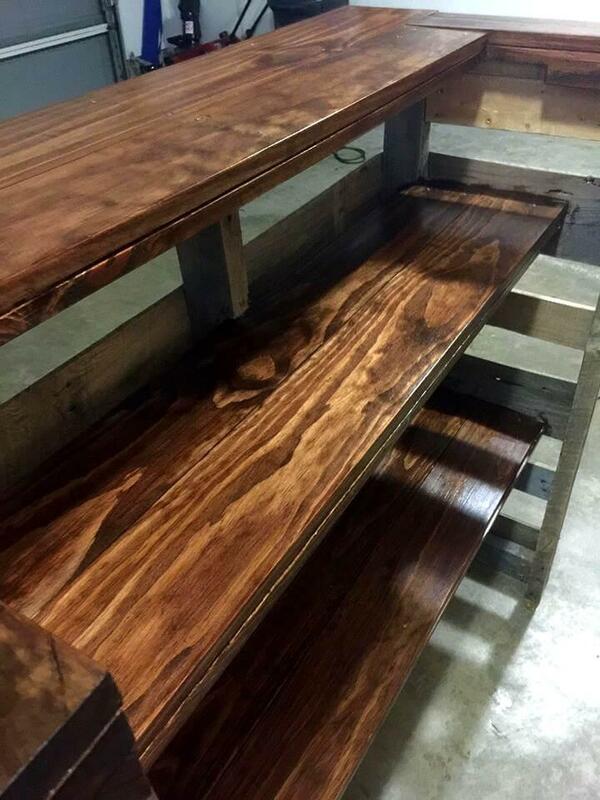 There may be amazing finishing options, you can even select multiple stain shades for multiple different tones of wood, prefer the minwax black for a dominant black look of surfaces, use golden oak stain, red mahogany, light walnut and also dark walnut stain to make the wood appear in respective tones of wood! The wooden surfaces can also be sealed using different wooden sealants, final stain and sealant coats also depends on the nature of pallet wood you are using in your project! Epoxy resins, wooden oils and polyurethane treatment are the most popular solution to seal the integrity of wood for a long long time! For an exclusive modern decorative touch, the lights have been installed to bar interior, which just makes it a big pleasure to view at night! Custom mini lights bulbs, Chinese LED flood lights and other twinkling lights across the boundary of this bar table would be a perfect choice for an ever charming illumination of this bar design at night! 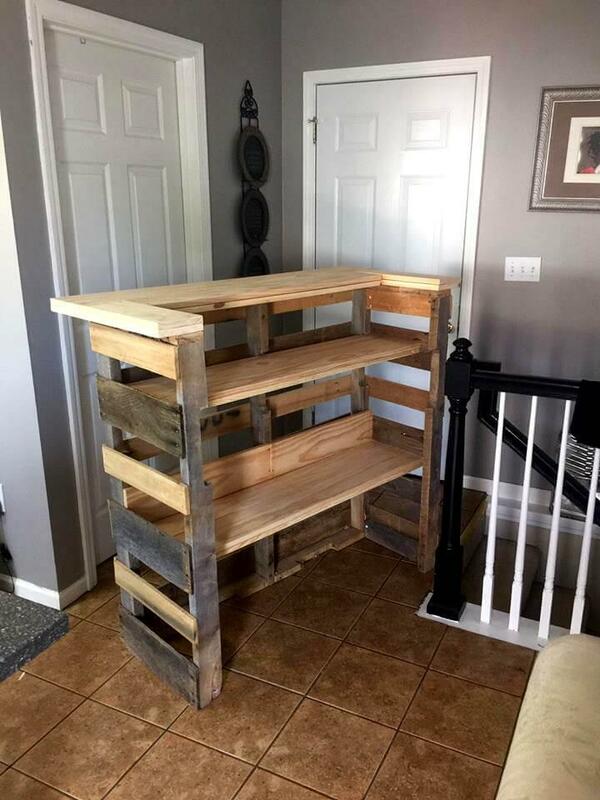 Get yourself inspired of this sample storage plan, beverage bottles and beverage glasses have been organized way so one can easily make a delicious drink by simply standing inside of it! 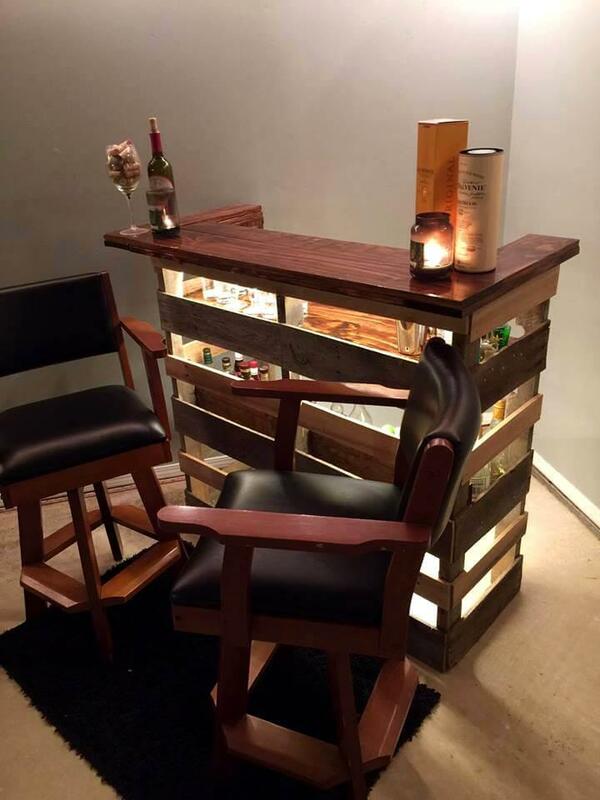 Surround this handmade lighted bar with sitting stools or chairs and have a lovely time to spend with your partner or friend! 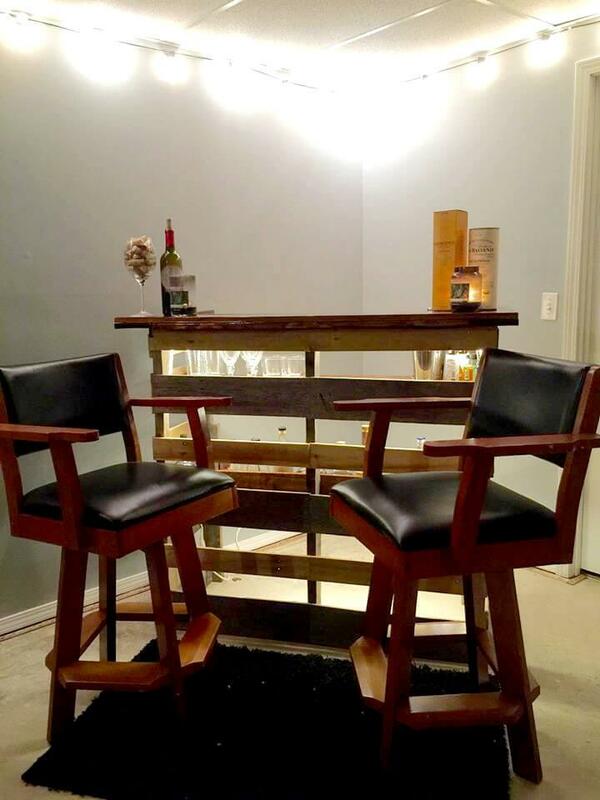 Perfect design for any of your custom indoor bar! 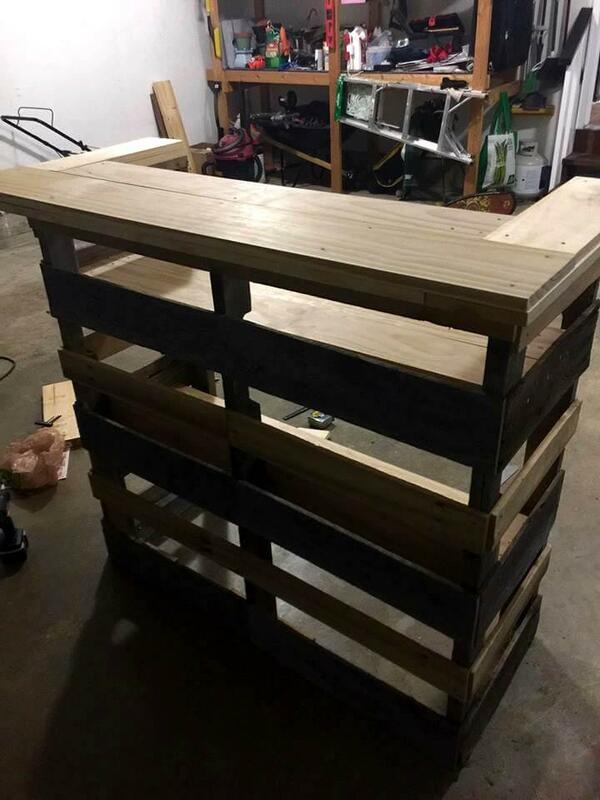 This is here an all intelligent pallet bar to see, gives a super stable model of wooden bar perfect for both indoor and outdoor summer parties!